Now that our first birthday is over, we are in the process of sorting out our 12 Days of Christmas at the Claudia McGloin Clinic. 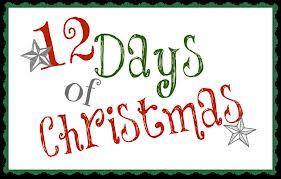 Everyday from tomorrow 13th December until 24th December 2012, we will offer a daily discount on treatments and skin care products. 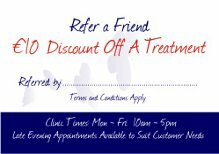 Make sure to check on our Facebook business page - https://www.facebook.com/claudiamcgloinclinic and our website - www.claudiamcgloinclinic.com for the daily offers available exclusively at the clinic. 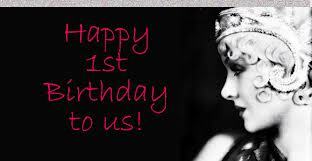 The Claudia McGloin Clinic turned one today on 12/12/2012. It's been the most amazing year and it's hard to believe that one year has passed by so quickly! The old saying 'Time flies when you're having fun' is so true! A special THANK YOU goes out to all friends and family for their endless support. Also a very special THANK YOU goes out to all of the clients for their continued support. You are amazeballs and you make it such a pleasure to come to work in the morning! Happy Birthday to us and here's to many more! The Claudia McGloin Clinic are proud to have donated several Shoeboxes filled with toys, toiletries and much needed items including writing paper and pens to the TEAM HOPE IRELAND Shoebox Christmas Appeal 2012. TEAM HOPE are an independent Irish interdenominational Christian relief and development Charity who are trying to make a difference by providing children who have nothing with the Gift of Hope this Christmas. For more information on TEAM HOPE and the Christmas Shoebox Appeal click on the link below. We are proud to be apart of such an amazing cause and we hope that we will bring some joy to several children around the world who need it this Christmas. These children may not have even heard of Ireland or even know about Christmas but to give them these very small gifts that we take for granted each day and to see the smile on their face is fantastic to know that we have made a huge difference in these childrens lives! 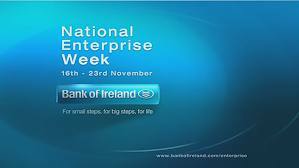 The Claudia McGloin Clinic are delighted to have been asked by Bank of Ireland to be part of National Enterprise Week at their Stephen Street Branch. The clinic will be showcasing from Friday 16th November 2012 until Friday 22nd November 2012. Claudia McGloin founded the Claudia McGloin Clinic in Sligo, Co. Sligo, Ireland in December 2011. Since then she has founded The Vein Clinic Ireland and Medical Aesthetics Courses - both divisions of the Claudia McGloin Clinic. 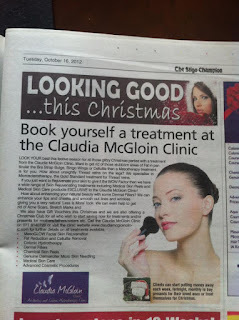 The Claudia McGloin Clinic are also on Twitter and Linked In. Follow the clinics on these various pages and websites to get up to date information on treatments and procedures and to get information on special offers available at the clinics. The Respiratory Ward at Sligo General Hospital are looking for a specialised monitor that will test the Oxygen Levels in the blood by Non Invasive means. Currently, this test is done by invasive measures called an ABG - Arteriole Blood Gas which mean a needle being stuck into the patients artery. This test is painful and uncomfortable for the patient. This monitor will mean that the patients results are immediate with no waiting around for laboratory results and of course is NON INVASIVE! The Fundraiser is a concert showcasing some of Ireland's top Country Bands and Singers. Admission for this event is €10 and the tickets can be purchased from Michael McGloin. Please call 071 9140728 or 087 2448653. The Fundraiser Event takes place on Tuesday 2nd October 2012 in the Best Western Sligo Southern Hotel. The TOSCA monitor that is required for The Respiratory Ward at Sligo General Hospital. It promises to be a fun filled evening and there is also a raffle. Prizes include a Gift Voucher from the Claudia McGloin Clinic for an Aqua Detox Treatment. Claudia McGloin exhibited the Claudia McGloin Clinic at the Mature Living Exhibition 2012 at The Royal Theatre, Castlebar, Co. Mayo recently. The event was a huge success and we had the opportunity to meet some amazing people. It was also lovely to meet so many people who had read Claudia McGloin's monthly editorials in the Mature Living Magazine and the feedback from the articles was fabulous. The visitors to the exhibit were also delighted to meet Claudia and to get the opportunity to ask further questions on the treatments and procedures offered at the clinic. Claudia even managed to pick up the nicknames 'The Diverticulitis Lady' and 'The Vein Lady'. 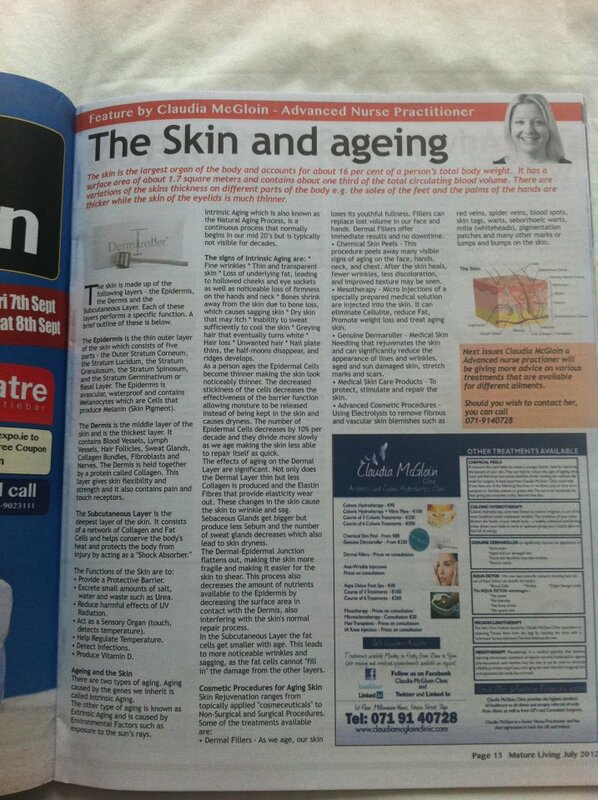 The Vein Clinic Ireland a division of the Claudia McGloin Clinic also launched their new website which coincided with the September Editorial for the Mature Living Magazine on Thread Veins. Fuerteventura - What a fab holiday? Firstly, I must apologise for the lack of recent posts/blogs. This was due to the fact that I was out of the country on a well earned, well deserved sun holiday! It has been a very hectic and somewhat stressful (at times) year and due to the weather in Ireland being very wet, wet and wet, it was decided that a September SUN holiday was the order of the day and just what the doctor or in this case the nurse ordered! It was decided very early on that the holiday would be a very relaxing and chilled one - sun loungers and pool :-) We also decided that we were NOT going to do the whole English restaurant fish and chips thing but dine out in the finest restaurants and eat fresh fish (I don't eat that much fish as I am not a huge fan but did have Calamari!) and eat what the locals ate! This also extended to the wine and the sangria! 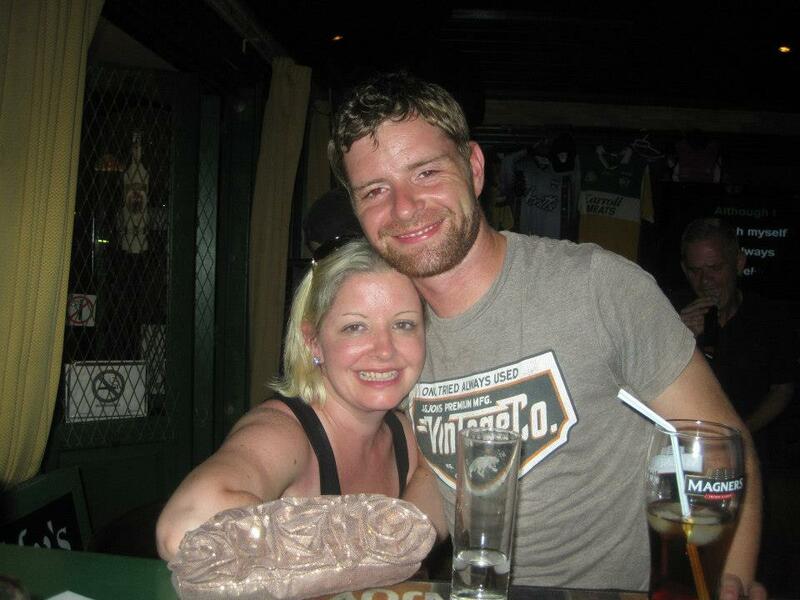 We did stick to this but to my surprise we ended up in an Irish Bar on the first night and we never looked back! Now we had been guided to what was described as an amazing rock bar and on the way I spotted McCarthy's Irish Bar and suggested that we have ONE drink for the road before we headed into the rock bar! We did exactly what we intended to do and left but we soon returned and we were so glad that we did. Why do Irish people always congregate to the Irish Bars?? It's for the craic agus ceoil. McCarthy's Bar is an amazing bar and funnily enough we discovered soon after we returned that the musician was from Offaly and the owner of the bar was from Sligo - you couldn't make this up so, enough said! Also, I have NEVER tasted such amazing Baby Guinness as I did in McCarthy's Bar! This of course being followed by sangria! Of course there was also another fab Irish Bar for after hours drinks - Paddy's Bar! There is a theme forming here - the Irish stayed with the Irish and went to the Irish Bars but we had an amazing time and we did manage to get in a few of the other cocktail bars as well but we found the craic to be much better in these 2 Irish Bars. I've been asked several times about why I started doing Colonic Hydrotherapy and if I have ever had any treatments myself and if I really found them beneficial?? The answer to that is YES, I have had several Colonic Hydrotherapy treatments and YES they are extremely beneficial. They have really worked for me and helped me hugely. While there are still some sceptical people out there about this treatment, all I can say is - Come and have a treatment with ME! I will prove to you that these treatments really are beneficial to the body and more importantly that they do work. I have treated several patients with various chronic illnesses and following a few treatments they were feeling much better than they had in a long time. I am currently researching some illnesses and Colonic Hydrotherapy and am currently writing a book on Colonic Hydrotherapy so, I will share more about the research in the book. 8 years ago I went to the Dominican Republic for a 2 week all inclusive holiday. The resort was a gorgeous 4* resort BUT there was an infestation of flies. The staff didn't do enough to stop the pests getting onto food, drinks and guests! There was a BBQ one evening and they were serving lobsters...Well you couldn't see the lobsters with all the flies! I do have pictures of this but I don't think anyone wants to see them! It is gross! After a couple of days at the resort, I started to become unwell. I suffered diarrhoea, was nauseous and felt very drained. I couldn't venture too far from the pool as I was constantly running to the loo. I would only use the bathroom in my room - out of courtesy to other guests plus the public loos were awful! Thankfully, my room was near the pool! By the second week I was also experiencing headaches and was getting much worse. I was told by the holiday rep that I was OK as I could look after myself seeing as I was a nurse! Charming! The rest of the holiday was pretty much the same - feeling awful and running to the loo all the time! Other guests were reporting the same ailments but nothing was done at the resort regarding the infest! When I returned to the UK, I still wasn't well and I went to see my GP. He refused to send me to The Hospital for Tropical Diseases in London as I suspected that I had picked up a parasite. I couldn't eat certain foods as my stomach was now crippling me! I even asked about sending me to see a food specialist just in case I had a severe food allergy. He told me I was wasting my money and he wouldn't refer me. I had to basically wait and see it it would subside. It did settle but after a few weeks the symptoms re occurred. This would happen on and off for months. This was a definite sign that I had picked up a parasite and that it was lying dormant for a time in the colon and would then awaken and cause havoc! I was so frustrated with my GP and I remember going back to see him after about a few months and saying that my cousin has Colorectal Cancer and now had a colostomy and I need to be seen by a specialist! This spurred him into sending a referral to the General Surgeons. After several blood tests and examinations, I was told that I could fly as they felt that I was stable enough and they didn't think anything would happen mid flight! The results came back from the Flexisigmoidoscopy and there was noting there. I was told I could potentially have Crohn's Disease and that I would need further investigations. NOT ON YOUR LIFE after my previous experience! I self diagnosed myself with Irritable Bowel Syndrome (IBS) and I knew that certain foods would trigger a relpase so I tried to avoid those foods but it was hard. I had read articles about Colonic Hydrotherapy and like most, was a bit nervous about it to begin with. After conducting lots of research, I knew that this was a beneficial treatment and I trained in Colonic Hydrotherapy. 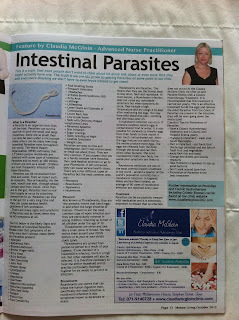 The treatments have really helped me with my IBS and the parasite hasn't reared it's ugly head! Along with a Colonic Hydrotherapy treatment a Parasite Cleanse Colonic Enema does the trick and I recommend that everyone have one of these on a yearly basis. I honestly believe that if I had a Colonic Hydrotherapy treatment all those years ago, I wouldn't have had to endure the trauma of the Flexisigmoidoscopy and the trauma of a suspected perforated bowel! 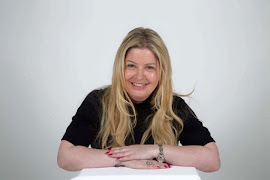 The Claudia McGloin Clinic have been rated within the top 5% of clinics for Customer Service by WhatClinic.com patients after receiving 100% POSITIVE FEEDBACK. This qualifies the clinic for a 2012 Customer Services Award. Colonic Enemas are an important part of the Cleansing and Detox process to obtain optimum results from a Colonic Hydrotherapy treatment. 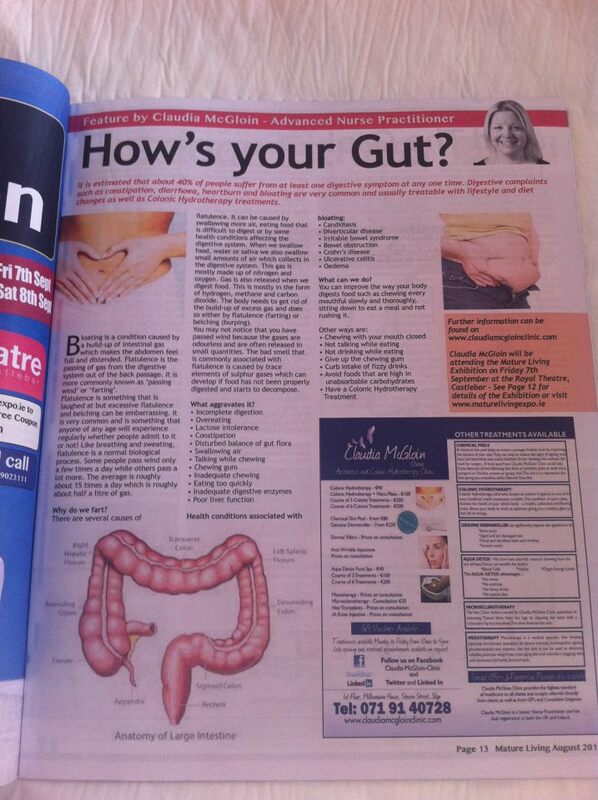 At the Claudia McGloin Clinic, we offer various Colonic Enemas and Implants. 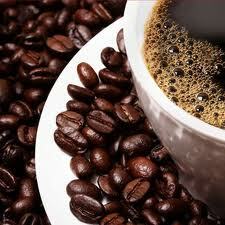 One such Colonic Enema is a Coffee Enema. This Detoxifies the Liver and stimulates both the Gallbladder and Liver to remove all TOXINS from the body. Colonic Enemas assist the Colon in emptying and also to HEAL the Colon. We have seen some amazing results so far with Colonic Hydrotherapy treatments as stand alone treatments in patients suffering from a variety of conditions and in addition we are starting to see even better results from adding the Colonic Enemas to the Colonic Hydrotherapy treatments. We are continuing to promote Colon Health by including these Colonic Enemas and Implants to our treatments in order to maintain optimum results Colonic Hydrotherapy treatments. Furthermore, we can combine Colonic Enemas to suit the individual need of our patients. Currently, we are researching the use of Colonic Hydrotherapy treatments in a couple of medical conditions and will release more information on this soon. Tougher regulations are badly needed in the Cosmetic Surgery Industry in both the UK and Ireland. uncil (NMC), British Association of Cosmetic Nurses (BACN) and An Bord Altranais. Claudia is also a Member of The College of Phlebology and the International Association and Register of Integrative Colon Therapists and Trainers (RICTAT). 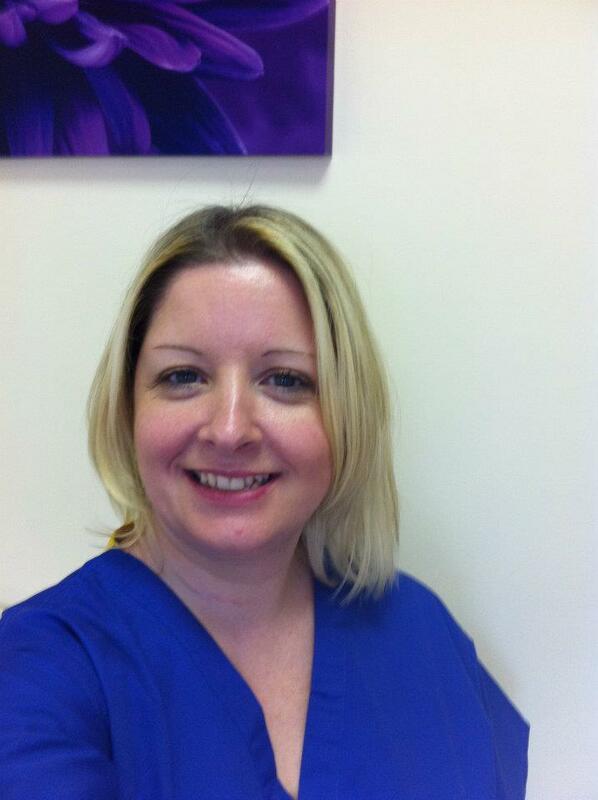 Claudia McGloin is an Advanced Trauma and Orthopaedic Nurse Practitioner, Aesthetic Nurse Practitioner and Colonic Hydrotherapist. She is also a Member of The College of Phlebology. 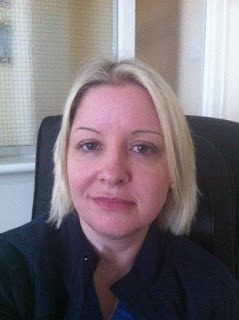 Claudia strictly adheres to the Codes of Conduct, Standards and Ethics as set out by the Nursing and Midwifery Council and An Bord Altranais and ensures the strictest policy of Patient and Client Confidentiality. Claudia also follows the strict laws and guidelines outlined by the Irish Medicines Board (IMB) on the use of Botulinum Toxin and other Prescription Only Medication (POM). While there are no specific governing bodies in the Republic of Ireland regarding Private Medical Clinics, Claudia is following the guidelines that she has previously been working with in the UK as set out by the Care Quality Commission (CQC) and is in the process of being governed by an American Regulator Healthcare Company. Furthermore, any Medical Professional who carries out sessional work at the Claudia McGloin Clinic is also fully qualified to carry out medical and surgical procedures. Claudia McGloin will be on hand at the Mature Living Exhibition 2012 at the Royal Theatre, Castlebar on Friday 7th September to answer health questions in relation to Orthopaedics, Vascular, Cosmetic Surgery and Colonic Hydrotherapy. Visit www.maturelivingexpo.ie for more details on the exhibition and visit www.claudiamcgloinclinic.com for more details on treatments and procedures available. Claudia McGloin has an editorial on Osteoarthritis in the Health Section in Sligo Today. Editorial in the August 2012 edition of Mature Living Magazine. Causes and treatment for Bloating and Gas. 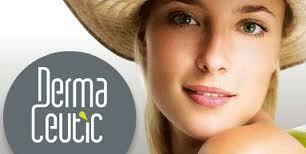 Dermaceutics are EXCLUSIVE to the Claudia McGloin Clinic and to Sligo. 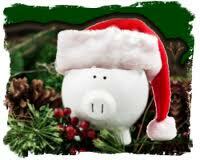 For every €1 you spend in the clinic on Aesthetic Procedures we will give you 1 point. 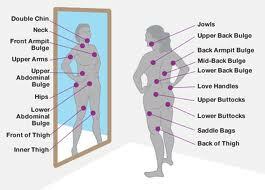 Areas that are successfully treated with Mesotherapy Micro Injections for Fat Reduction, Cellulite Reduction, Skin Rejuvenation and Body Contouring. Mesotherapy is a medical technique that was developed in France in 1952 to improve circulation and treat conditions like rheumatology, sports traumas, infectious and vascular diseases. It has subsequently proved to be a very effective cellulite treatment and also is also good for fluid retention, lymphatic drainage, localised fat reduction and skin rejuvenation. Mesotherapy is can also be used for Hair Loss and Sports Injuries including Pain Management. 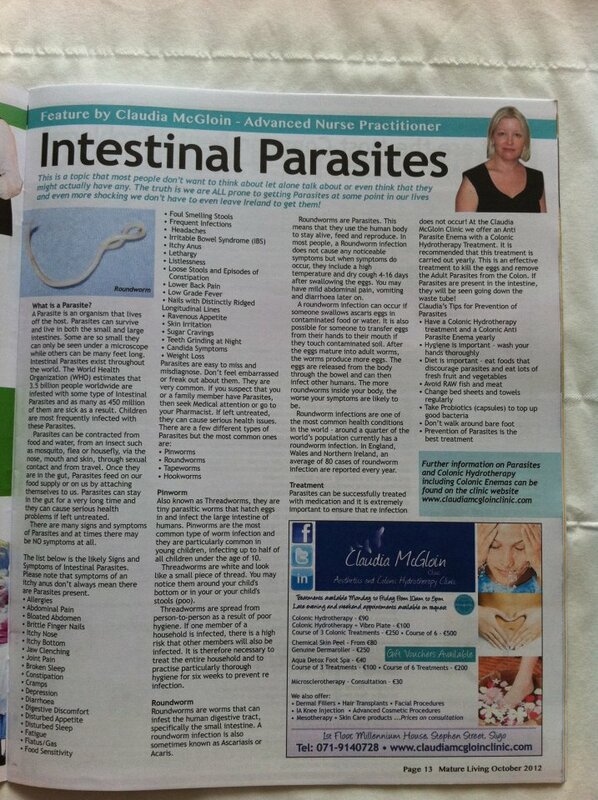 All of which are available exclusively at the Claudia McGloin Clinic. A specially prepared mixture of vitamins, homeopathic ingredients, amino acids, minerals and medications such as Hyaluronic Acid are injected into the problem area. This stimulates the fat cells and causes them to break away from the network of connective tissues in the skin. The excess deposits of fat are then dissolved and excreted through the bloodstream by the kidneys and bowel. At the Claudia McGloin Clinic we use the French method of application. This is a light touch and rapis motion of a tiny needle which is used to place the Mesotherapy serum under the top layer of your skin. This treatment is not painful and will leave your skin glowing, radiant, rejuvenated, lifted and toned! 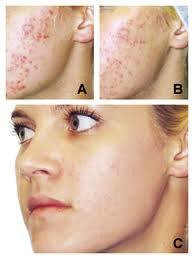 Mesotherapy is extremely successful in the treatment of aesthetic conditions. Cellulite and Orange Peel Effect and Weight Loss can be effectively managed with the use of Mesotherapy. The treatment stimulates the mesoderm, or middle layer of the skin, which in turn helps to disburse the cellulite. Mesotherapy involves injecting small amounts of homeopathic medicine immediately beneath the surface of the skin to break down the cellulite and to improve circulation and lymphatic and venous drainage. Each treatment takes about ten minutes and is not painful. After the treatment you can return to normal activities. The addition of Vitamin C to the mixture encourages the tone and quality of the overlying skin. Treatment may be carried out immediately after an initial consultation at which point you will be informed as to how many treatments you will require. Micro-injections are given weekly over a period of 4 to 8 weeks. Some individuals may require a course of 4 weeks, although a full treatment course takes 8 weeks. The treatment is long lasting and the results measurable. When the desired effects are achieved, all that is required is annual maintenance over a 4-6 week period. Superb results are achieved and those being treated look and feel better both during and after treatment. Overall, with a moderate amount of lifestyle change, Mesotherapy can provide measurable improvements with people losing up to 2cm from the circumference of their thighs after only 6 sessions. Lycogel® Cover and Recovery is the first breathable colour corrective treatment that combines cosmetic and skincare technology to promote post procedure healing, soothe sensitive skin, rejuvenate and camouflage at the same time. Lycogel® breathable camouflage and concealer was originally developed to be used by doctors immediately after most cosmetic procedures to camouflage the signs of their intervention and promote a quick recovery process. The benefits of our unique formala have now been discovered by many to be suitable for use as an everyday camouflage. Lycogel® is transfer and water resistant. It allows skin to breathe and stay cool. It's smooth texture is like a 'second skin' and it is weightless and natural. Lycogel® is exclusive to the Claudia McGloin Clinic...Call the clinic today for your consultation on 071 9140728. Foamer 15 - MUST HAVE medical skin care product of the week! Foamer 15 is a gentle peeling treatment in the form of a mousse. It is highly concentrated to effectively purify, clean and regenerate the epidermis. The skin is instantly softer, smoother and healthier. The complexion regains it's healthy glow and a finer skin texture. Foamer 15 is an excellent skin cleanser and also regulates oily skin. I use Foamer 15 along with other Dermaceutic Medical Skin Care products including the occasional Medical Skin Peels. My skin is the best that it has ever been and it shocks people to learn that I am nearly 40! Dermaceutics is a range of Medical Skin Care Products and Medical Skin Treatments for use by Medical Professionals ONLY and so you won't find these products or treatments on the high street! 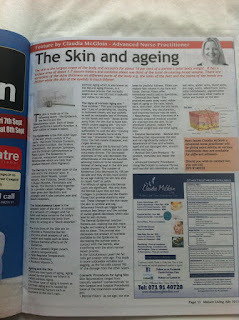 The Claudia McGloin Clinic were featured in the Health Feature of this weeks Sligo Weekender newspaper 3rd July 2012 on Treatment for Osteoarthritis. For the month of July The Claudia McGloin Clinic are offering 6X Mesotherapy Treatments for Cellulite Reduction and Fat Removal for €1,000. T&C's Apply. The Claudia McGloin Clinic are now offering Colonic Enemas to assist the Colonic Hydrotherapy treatment. This gives optimum results to your treatment and also helps to heal the Colon. We offer a choice of 6 Colonic Enemas. Please let your practitioner know prior to your Colonic Hydrotherapy treatment if you want to add a Colonic Enema to your treatment. These treatments are €20. 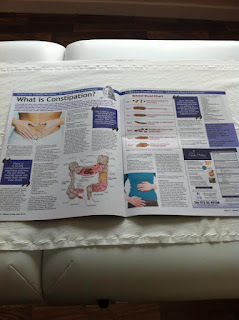 Claudia McGloin wrote a Featured Article in Mature Living Magazine June 2012 - What is Constipation? Discussed are treatments as well as Colonic Hydrotherapy which is the best treatment available at the Claudia McGloin Clinic. To book a consultation for treatment call the clinic on 071 9143172. 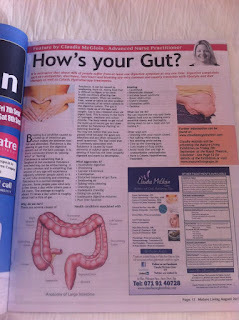 Check out this months edition of Mature Living Magazine and read Claudia McGloin's double page editorial on Constipation and Colonic Hydrotherapy on pg 26/27. 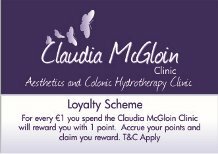 When you have had a treatment at the Claudia McGloin Clinic if you refer a friend for a treatment, you will get €10 off your next treatment. The more friends that you refer for treatments, the more money you will save on your treatments and who knows you might even get a free treatment. T&Cs will apply. Please visit the clinic website www.claudiamcgloinclinic.com for T&Cs and more details regarding treatments and clinic news. 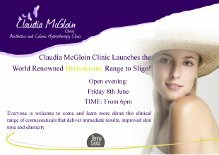 The DermaCeutic range was formally launched into the Claudia McGloin Clinic last week. 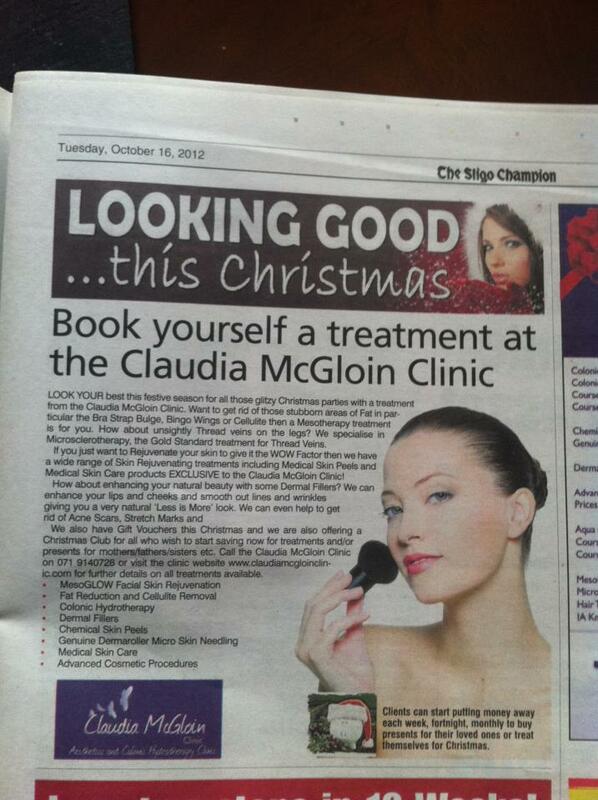 It is exclusive to Sligo and to The Claudia McGloin Clinic. DermaCeutic is a full range of cosmeceuticals to Prepare, Optimise and Maintain Results of all aesthetic procedures. DermaCeutic is also a range of Chemical Peels used by Medical Skin Care Specialists. 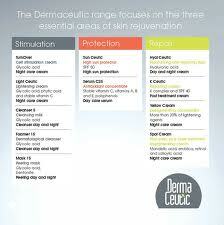 Dermaceutic works on 3 areas Stimulation, Protection and Repair. Apart from the Skin Peels used in the clinic which are Medical Strength and used by Medical Professionals only, we also offer an extensive home care range for you to achieve optimum results. Mask Peel - a very superficial peel for Greasy, Acne prone Skin, Visible Pores, Excess Sebum and Dermatological Facial Cleansing. Milk Peel - a superficial peel for Dull Complexion, Wrinkles, Epidermal Stimulation and Smoothing Effect. Spot Peel - a medium Depigmenting peel for Pigmented Skin, Pregnancy Dark Spots, Melasma and Post Inflammatory Pigmentation. Cosmo Peel - a medium Rejuvenation peel for Ageing Skin, Smoker's Complexion, Dark Spots, Wrinkles and Stretch Marks. DO YOU want to look your best for summer or for that special occasion that's coming up? Then the Claudia Mcgloin Clinic is the place for you! We have an array of Non Surgical Cosmetic Procedures and Medical Skin Care Products and Home Treatments to get you looking your optimum best this summer. And we also have a secret! Shhh! Have you ever wondered why French women look so radiant, elegant and vibrant? Want to know their secret? It's Mesotherapy and it's available at the Claudia Mcgloin Clinic. Mesotherapy is a medical technique that was developed in France in 1952 and is clinically proven to be effective for Cellulite Reduction, Fat Reduction, Hair Loss, Sports Injuries, Pain Management and of course Skin Rejuvenation. A specially prepared mixture of Vitamins, Homeopathic Ingredients, Amino Acids, Minerals and medications such as Hyaluronic Acid are injected into the problem area. This stimulates the fat cells and causes them to break away. At the Claudia Mcgloin Clinic we use the French method of application. This is a light touch and rapid motion of a tiny needle which is used to place the Mesotherapy serum under the top layer of your skin. This treatment is not painful and will leave your skin glowing, radiant, rejuvenated, lifted and toned! Time to say goodbye to the saddle bags, love handles, jowls, eye bags, cellulite and fat and say hello to rejuvenated, glowing tones youthful and radiant skin. In addition to Mesotherapy, we can combine other treatments such as Skin Peels, Genuine Dermaroller, Anti Wrinkle Injections and Dermal Fillers to give you the best results for a natural, less is more look. We also have some amazing Skin Care Products that will compliment your treatments and give you the wow factor. Have you got Thread Veins on your legs that look unsightly and are preventing you from showing your legs? Microsclerotherapy involves injecting the veins with a chemical by using a tiny needle. This destroys the vein making the walls of the veins fibrose (or stick) together. After the treatment, you will need to wear compression stockings for 2 weeks. The full benefit can take up to 12 weeks to be seen. Laser treatments are NOT used or recommended for Thread Veins of the legs at the Claudia Mcgloin Clinic. Need to Detox? Did you know that 80% of all illnesses start in the large intestine? Then a Colonic Hydrotherapy treatment is for you!